It is a piece of established wisdom that learning something new makes you happy. That may be true, but it’s hard. 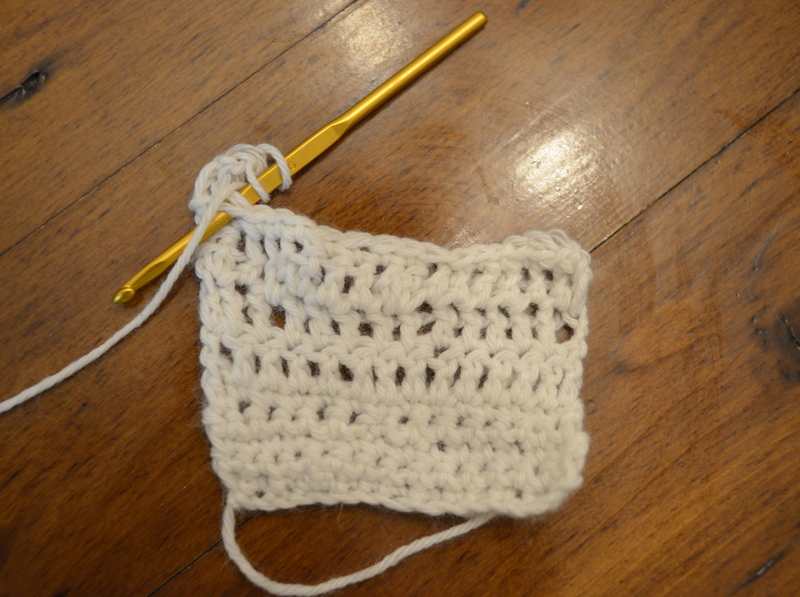 For years, I’ve been promising myself that I would make time to learn to crochet. I’ve watched people on the subway elegantly hooking, and admired their graceful hand movements and swift progress. I’ve heard other knitters extol the virtues of crocheting, particularly how quickly you can finish large projects like blankets. But learning something new is hard. Despite my deep-set habits, this past Tuesday, I mustered the courage to trudge through the snow and attend a basic crochet class at my LYS. As these pictures attest, my form is poor and my progress anything but swift. 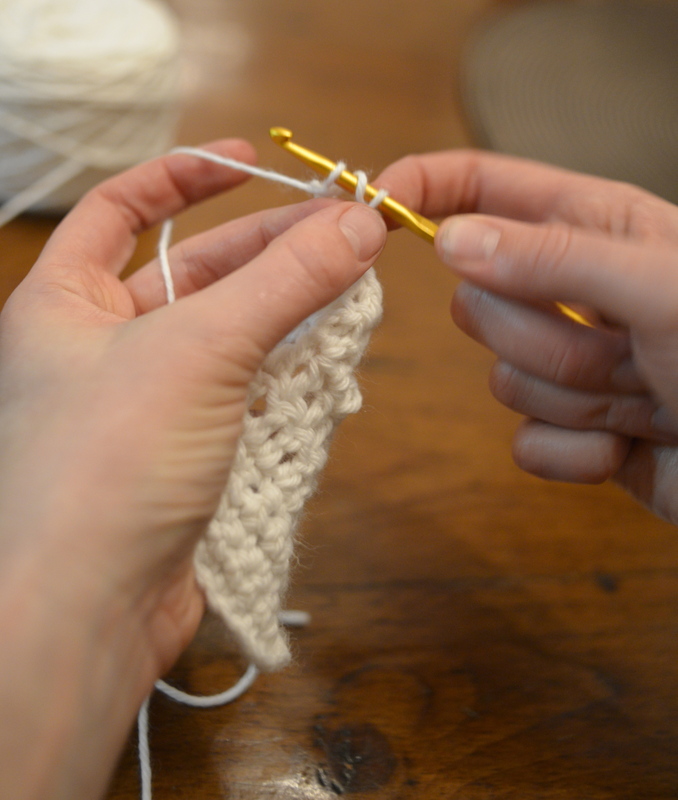 It was a humbling experience to be shown again (and again and again) how to hold the yarn and how to create a basic single crochet. 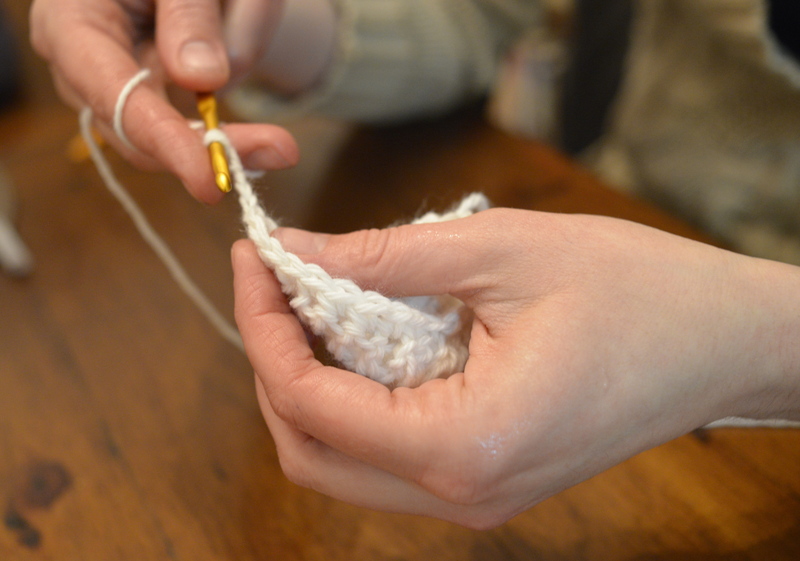 My knitter’s hands unconsciously moved the yarn to my right hand, as soon as my concentration wavered. My tension was inconsistent and I made beginner’s mistakes. I had to rip out rows and start again when I missed stitches or forget to make a turning chain. After two hours of laborious work, I had this tiny square. And I loved it. The happiness of learning something new doesn’t really come from the skill itself (although a beginner crochet baby blanket pattern is calling me). For me, it came from the idea that I can now do something completely new. I can train my 30 something hands to move in new patterns. I can train my sleep-deprived mom brain to follow new ideas. I can do something new. And it’s hard. As a teacher, I am often frustrated when I’m unable to communicate a new math skill to all of the kids in my class. We try a hands-on activity, I explain the concepts, we do examples, I explain the concepts again in a different way, and still some students are lost. Each time this happens, I rack my brain for new strategies, I consult colleagues, and I whine that this is why teaching the other subjects is so much easier. But I had forgotten how hard it is to learn something new. I had forgotten that being able to follow the steps is not the same as being able to do them independently, perfectly, every time. I didn’t remember how easy it is to forget something you’ve only done once, or that our minds and bodies like to move in established patterns. I had lost touch with the struggle with the unfamiliar. I had forgotten that it’s hard, and it makes us happy. This entry was posted in Crocheting and tagged challenge, crochet, habits, happiness, learning something new, teaching on January 10, 2013 by lisagono.